When the weather turns warm, many people celebrate by putting the tops down on their convertibles and hitting the open road. 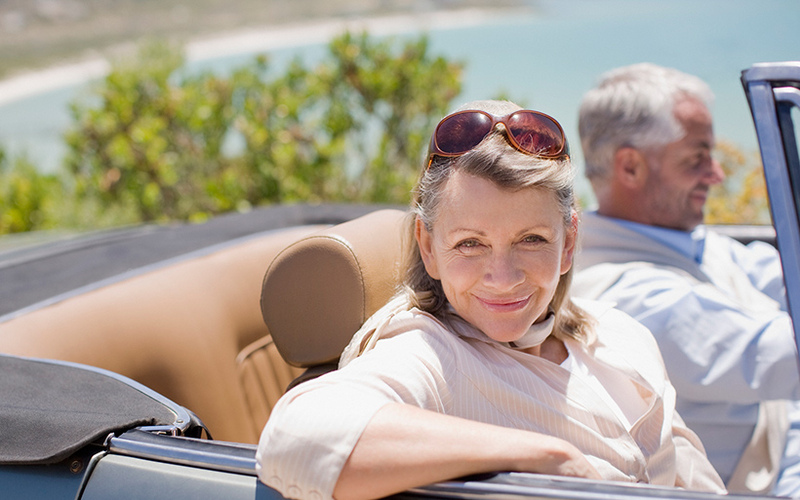 Taking short trips in convertibles is safe enough, but prolonged exposure to the loud sounds people hear with the top down can cause temporary or long-term hearing loss, and convertibles aren’t the only culprits. Ears are very sensitive instruments that depend on several parts to work properly. Noise-induced hearing loss, or NIHL, occurs when sound damages the inner ear, disrupting your body’s ability to process sound properly. The inner ear contains tiny hair cells that help the cochlea send sound signals to the brain. Short and long-term exposure to loud noises can damage or destroy these hair cells, and they don’t grow back. Without these hairs, sounds signals to the brain are disrupted, resulting in hearing loss. The problem occurs when sounds hit 85 decibels. Things like firearms and firecrackers hit 150 decibels, and even a short exposure can temporarily affect your hearing. Parents aren’t just being controlling when they tell kids to turn down the volume or take off their headphones. Many electronic media players hit over 100 decibels at maximum volume, and long-term exposure can cause permanent ear damage. Other everyday items that can lead to hearing loss with prolonged exposure include woodworking tools, lawnmowers, and leaf blowers. Research shows that when people drive with the top closed on their convertibles, or if they only take short trips, they do not show signs of hearing loss. With the top down, however, people in convertibles are exposed to sounds at decibel levels that are much higher. Heavy city traffic breaks 85 decibels, and when the top is down people are much closer to that sound. They are also exposed to spikes in decibel levels, such as from passing motorcycles that hit 95 decibels, or buses and other loud vehicles. The sound of the wind itself can cause damage when people drive at 55 mph with the top down. Researchers at the Saint Louis University School of Medicine studied decibel levels at 55, 65, and 75 mph using five models of convertibles. Driving at just 55 mph with the top down led to sound levels that hit the damaging 85 decibels, and they reached just under 90 decibels at 75 mph. With the tops down on the same cars at the same speeds, there were no sounds that broke the 85-decibel mark. People can’t avoid everyday noise, but there are things we can do to limit the probability of hearing loss. The National Institute on Deafness and Other Communication Disorders recommends avoiding sounds that are loud, close, and last too long. If people cannot avoid these sounds, they should wear ear protection and make sure to help protect the ears of children. People don’t have to give up their beloved convertibles, but should understand the risks of long-term driving with the top down and how higher speeds make the potential hearing loss problem worse. Garaging convertibles over the colder months not only helps protect cars, but it also helps protect your quality of life. Can Earplugs Cause Hearing Loss? Can You Recover From Hearing Loss? Earplugs are supposed to help protect your hearing. Used improperly they can actually harm it. Scientists are hard at work on technology that could be a game-changer for people with profound hearing loss. Make your hearing batteries last longer. These tips could double or even triple the life of your hearing aid batteries. Why Does My Hearing Aid Sound Muffled?